Jane talked about the action research project carried out by Culture 24 and 17 partner cultural organisations. The outcome of which is the ‘How to Evaluate Online Success’ report which provides a sector wide benchmark, and a social media toolkit. The report showed that museums and other cultural organisations only command a very small proportion of online attention share. To succeed Jane suggested museums need to embrace both agile working, and failure – two things that may seem like alien concepts to many museums. In order to succeed Jane suggested museums needs to build brands around specific interests, niche rather than mass. Reassuringly for smaller museums she highlighted that whilst money may buy web hits, it does not buy engagement! My main ‘take home’ from Jane’s talk is a simple question, that I think we all need to ask more often…. ‘If the answer is an app……What was the question? Pesky People: Go Genie a site to allow people to check the accessibility facilities of cultural organisations before they visit. iMuse: a programme to enhance the enjoyment and educational value of museums for people with communications disabilities. The Museum of London team talked about moving towards a digitally integrated system, that allows different departments to re-purpose and re-use the same content. Essentially the creation of ‘sustainable and efficient working practices’. Working across departments the team made the case to senior management for increased inter departmental digital projects, placing an emphasis on building solid foundations the team worked together to appreciate each others priorities from learning audiences to data standards. One of the outcomes of this is the Picture Bank, an online image service that was created with a view to being used by teachers in classrooms. The focus of their work has been laying steady foundations, integrating data management across departments, and embedding future proof thinking in all that they do. On twitter the main conversation point during their talk was the challenge of making the case for digital to senior management, something the Museum of London team seem to have done successfully. This project collates data on the 800,000 people who’s names are on war memorials around the country, but this is just the starting point working with partner organisations, and the the general public the aim of this project is to start to piece together the life stories behind these names. The project uses a range of digital platforms from Flickr to Facebook to disseminate the information they already have, and also to reach a wide range of audiences. As Luke and Giv said nearly every school in the country is within walking distance of a war memorial, this however moves the concept of the memorial beyond a name and a stone to allow people to engage with and help uncover the individual stories of those that served. Joseph talked about the National Galleries use of IIPImage to manage high resolution images. As digital imaging becomes more advanced file sizes continue to increase, for example most of the National Galleries computers struggled to open Google Art Project images properly. IIPImage allows the gallery to manage large image files to create a day to day working system for conservators, allowing conservators to view, annotate and examine images as they work on them. These images are also used to compile technical bulletins. Jon introduced the new digital commissioning programme ‘The Space’, the video below provides an overview of the programme. The key detail to note is that arts organisations must submit expressions of interest by the 9th of December. Research is important. Funders and Senior management may not get digital, so we need to create a strong evidence base to demonstrate the value of what we do. 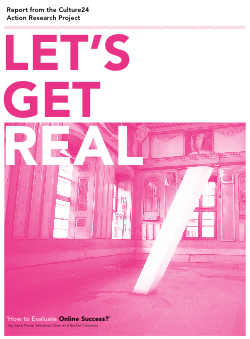 The Let’s Get Real report is a great example of research that helps make the case for digital, but also provides a benchmark from which to measure success….and failure. Partnership is key to success, from skill sharing to developing niche networks and projects that incorporate collections from a range of museums such as IWM ‘Lives of the Great War’. Eat cake (as advocated by Claire Ross). Eating cake, and in person meetings help to keep project teams motivated to push boundaries, to try new things, to bounce back from little failures and to create even greater successes. As ‘official blogger’ I just want to say a massive thanks to all the speakers and to the Committee for organising such a varied and exciting day. It’s great to work in such a diverse, engaged and generous sector – I just hope I’ve managed to convey some of this vibrancy in my blog posts. I look forward to seeing MCG members at future events and to continuing the conversation on the MCG list and on Twitter.